“Macbeth” Mashup. Funny? Yes. Good Curriculum Choice for 7th and 8th Graders? No! Of course, I received multiple links to the NY Times“Macbeth Mashup“from fellow English teachers, and yes, I thought that Claire Needell Hollander wrote a very funny piece. Yes, I believe students should be exposed to Shakespeare regularly, with or without the recommendations of the Common Core State Standards (CCSS). But, Macbeth for seventh and eighth graders? No! That is just wrong. Wrong on theme, wrong for content, and very wrong for 11 and 12 year olds. She is right. A chemistry of personalities creates a different dynamic in every classroom. The age of those personalities is also a factor. As I read the piece, however, I grew more and more frustrated. Macbeth features witches, warfare, murder, and, like most Shakespeare plays, sexual language. The word “blood” is repeated 41 times over the course of the play. Even the play itself is cursed; actors will not say the name of the play in the theatre. Many critics consider this Shakespeare’s “darkest play”. 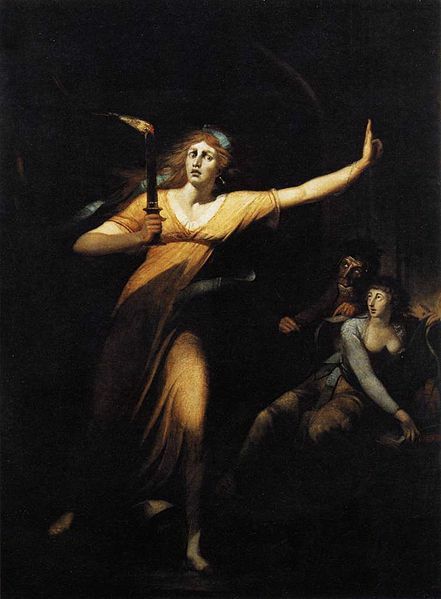 John Henry Fuseli/ Johann Heinrich Füssli, Lady Macbeth Sleepwalking. Musée du Louvre, Paris Date: 1784. Creative Commons. Lady Macbeth driven to madness and suicide because her guilt in participating in the murder of King Duncan which leads to the murder of the guards, Macduff’s family, Banquo, and others…the stuff that nightmares are made upon. Maybe? Definitely! So, why choose Macbeth? Texts that rely on literal, clear, contemporary, and conversational language tend to be easier to read than texts that rely on figurative, ironic, ambiguous, purposefully misleading, archaic, or otherwise unfamiliar language (such as general academic and domain-specific vocabulary). So many students come to high school without the necessary content to understand many of Shakespeare’s allusions. Perhaps the students know little about King Arthur and the Knights of the Round Table; why not Malory’s Morte d’Arthur? Or understanding the Pantheon of Greek Gods and Goddesses would be helpful; why not Edith Hamilton’s Greek Mythology? Beowulf is usually taught in grade 10; the opening begins, “He was spawned in that slime, /Conceived by a pair of those monsters born/ Of Cain, murderous creatures banished/ By God, punished forever for the crime/ Of Abel’s death” (Raffel). Student should know this Biblical story of Cain and Abel. Students must come to high school prepared with the content needed to understand increasingly complex texts. So why choose Macbeth? In fact, why choose Shakespeare at all? Ultimately, by not considering the recommendations of the CCSS to saturate students with the grade appropriate texts in our rich literary tradition, Hollander leaves them ill-prepared for Shakespeare at the high school level, when they are more mature to appreciate his themes. So please, leave Macbeth, with his nihlism, his “...tale/Told by an idiot, full of sound and fury,/Signifying nothing” for older students. Please leave Lady Macbeth with “…the smell of the blood still” where “all the perfumes of Arabia will not sweeten this little hand”, and leave Macbeth for high school. Besides, if Hollander is trying to meet the recommendations of the Common Core, she should leave Macbeth where the Common Core placed it, as a complex texts for 9th and 10th grades. The noisy mashup of Macbeth will still be crude and rowdy and demanding; but the students will be older, and these few additional years of maturity are necessary for dark tragedy in “the Scottish play”.